The Drupal community has been abuzz for the past two years with talk of "Becoming Headless" or "Decoupling All The Things." The trend raises reasonable questions from end users who feel this means Drupal is moving into a space that no longer represents them. We hear similar concerns from Drupal Commerce users when we talk about delivering headless commerce. However, we don't believe anyone should be worried that improving support for Drupal as a REST API server will detract from efforts to improve its utility as a traditional CMS. At the end of 2018, Dries Buytaert, creator of Drupal, asked folks involved with the project to share their thoughts on what's "holding Drupal back." His prompt came on the heels of two great blog posts related to his company Acquia's growth strategy and lessons he's learned and applied from Amazon's growth strategy. I didn’t beat his third post on overcoming Drupal’s obstacles to the punch, but the series did prompt me to think long and hard about the barriers we face as maintainers and leaders of the Commerce project within the Drupal ecosystem. We’ve had several great opportunities this summer to connect with the Drupal community and share our latest work on Drupal Commerce. We’ve been able to highlight specifically our efforts to progressively decouple Drupal Commerce on Drupal 8. Drupal Commerce is more than just a module project. As I laid out in my session at DrupalCon Vienna, it is an entire ecosystem supported by dozens of agencies and powering well over $1.5bn in online transactions annually. 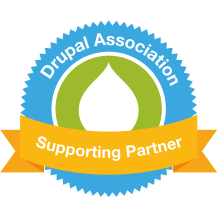 This makes Drupal Commerce one of the largest open source eCommerce projects in the world, and it's thanks in no small part to our Technology Partners (comprised primarily of payment providers) that we are able to invest as much of our time in it as we do. Braintree is one such partner and a fantastic supporter of Commerce 2.x since last Summer. During our sprint to release a beta at DrupalCon Dublin, they sponsored Bojan's time for two weeks to expand and improve the core Payment API. As a result, they also became the first integrated payment gateway and the test case for any payment provider following their integration pattern - individual iframes embedded into the checkout form for each payment field, making it easy to securely collect payment card data through your own checkout form. For the initial release of the Commerce Braintree integration on Drupal 8, we targeted basic credit card payment support via their Hosted Fields API. As of this week, we've finalized patches that add support for PayPal Express Checkout and PayPal Credit alongside credit card payment through Braintree. They are a PayPal company, after all! 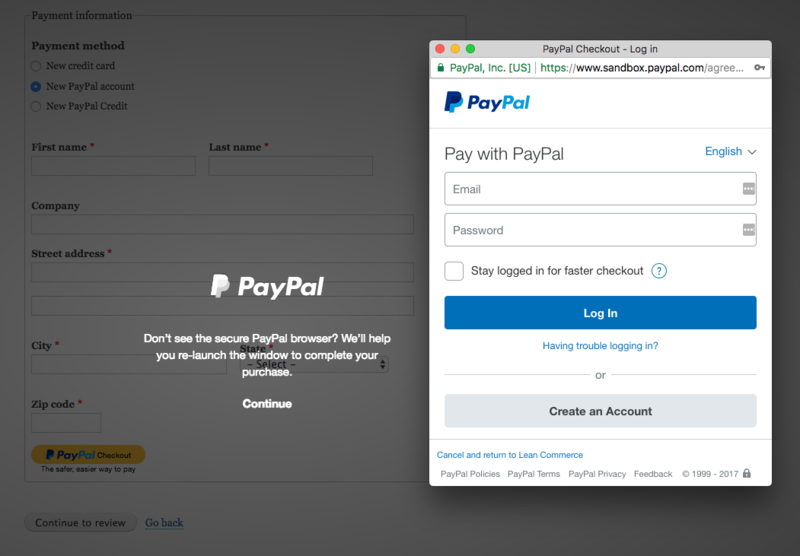 Customers can pay via credit card on-site or Express Checkout via a modal dialog. You can test the new features end to end by grabbing the latest release of the Commerce Braintree module and configuring it to work through the Braintree sandbox. If you get stuck, you can find us in the #commerce channel in the Drupal Slack or open an issue in the queue if that's not possible. We released Drupal Commerce 2.0-beta1 at DrupalCon Dublin one year ago. Over the next 9 months we tagged 6 more beta releases comprising over 500 commits by 70 different contributors working for at least 10 different companies. Now, just in time for DrupalCon Vienna, we have tagged the full 2.0 release, celebrating the achievement with Drupal contributors around the world on September 20th and 21st. Celebrating Commerce 2.0 with Circle WF in Pancevo, Serbia. Our release candidate phase was refreshingly uneventful (as you want it to be), giving us confidence to recommend developers begin using Drupal 8 and Commerce 2.x more broadly to develop their new eCommerce sites. Our team has contributed to a dozen projects directly, including architectural consulting and development. We also continue to see more case studies demonstrating how the new version is performing well at scale, making development teams more productive. Additionally, not only has Commerce 2.x eliminated the need for half of the top 60 contributed modules in Commerce 1.x, many of the major contributed modules still required have seen their own releases or very active development to address important use cases. For example, we released a third beta of Commerce Shipping for Drupal 8 to support stores selling physical products with multiple shipments, flat rate, calculated rates and more. We continue to work on those feature modules ourselves (e.g. Commerce License / Recurring) and in partnership with other Drupal contributors (e.g. Commerce Stock) to make Commerce 2.x ready for more and more use cases. 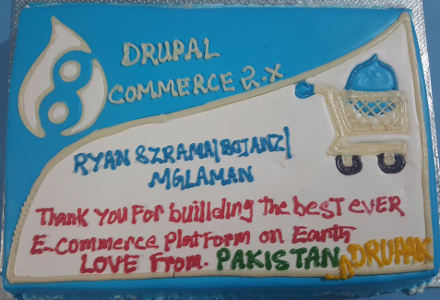 Drupal Commerce deserves cake! Thanks, Drupak. We're believe in Dries Buytaert's vision for Drupal as empowering ambitious digital experiences. For us that means continuing to improve Drupal Commerce to better support any company aspiring to grow their online sales. While our work on the project will never be "done", at this milestone, we couldn't help but pause to celebrate with a bit of cake. If you'd like to join us in celebrating this achievement, we're hosting a release party with our whole team and our friends from Commerce Guys by Actualys on Tuesday, September 26th, at DrupalCon Vienna a short walk away from the venue. We've timed it for dinner between the opening reception at the venue and the party later in the evening, with drinks and food on us until the tab dries up. Stop by our booth to get your ticket / directions, and come find the dozens of contributors here at DrupalCon to share your Drupal Commerce story with them in turn. The Drupal Commerce 2.x development process has been one big adventure! Over the last 2.5 years we've accumulated 2,000 code commits in multiple repositories from over 70 contributors at dozens of agencies. 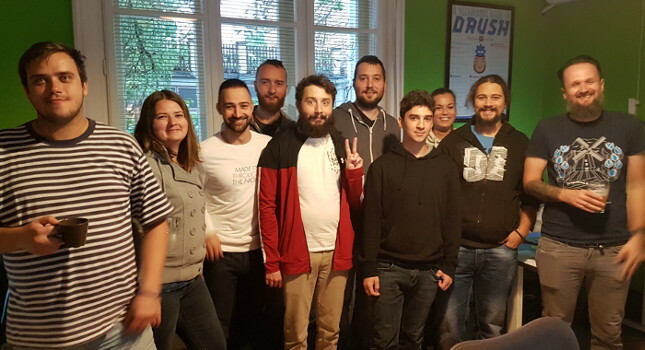 With last week's release of a stable Commerce 2.0-rc2, we've started preparing to celebrate the full release with parties around the world. Our plan is to release Commerce 2.0 on Wednesday, September 20th, just in time for us to show it off at DrupalCon Vienna. On September 21st, we are coordinating a series of release parties at the offices of a variety of contributing Drupal agencies, including 1xINTERNET, Acro Media, Actualys, Adapt, Blue Oak Interactive, Circle WF, MD Systems, Wunder, and more. With over 1,500 sites reporting usage and a growing number of high quality case studies, we can all feel proud of what we've achieved together. 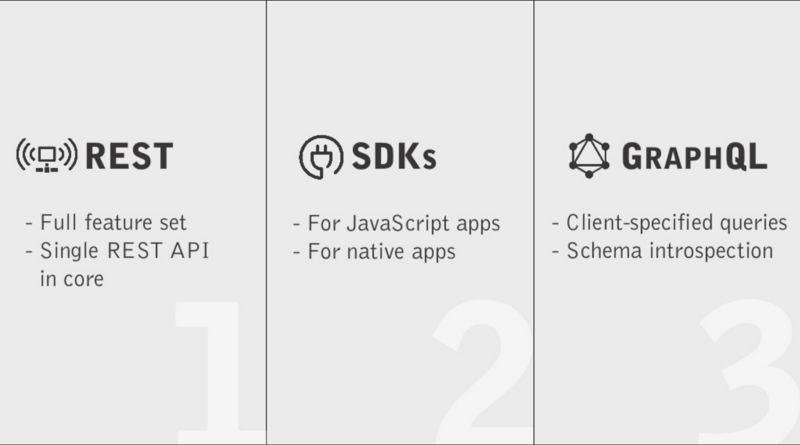 Many of these projects directly contributed to the development of core and other essential features in Commerce 2.x, including promotions, coupons, shipping, etc. We've created a Drupal Commerce 2.0 party list and showcase that we'll be updating as we go, and we invite you to get in touch to be added or to find a party near you. Any other ideas? Leave 'em in the comments and help spread the word! Square's pitch is pretty straightforward: accept payments anywhere, no coding required. They nailed this first through their simple phone based card readers and their slick in-store tablet interface. They also made it easy to process all major credit cards, guaranteeing deposits as soon as the next business day. While we're preparing to present the latest in Drupal Commerce in our session at 10:45 AM on Thursday, we're also getting ready to sprint on Commerce 2.x the full week from our booth. This will be our first opportunity to jam on code as a full team since our spinout, and we'd love to have you join us. Look for us near the permanent coffee station (intentional) beside Platform.sh and Acro Media, our delivery affiliate in the U.S. whose partnership and vision for enterprise Drupal Commerce have been invaluable as we've rebooted our business. Got Content? Get Commerce - The Power of "1"
eCommerce is undergoing rapid change from the traditional search, view, add to cart, and checkout paradigm to one that is rich in content, creates a more engaging and unified user experience, and drives buying decisions within that context. Read more about Got Content? 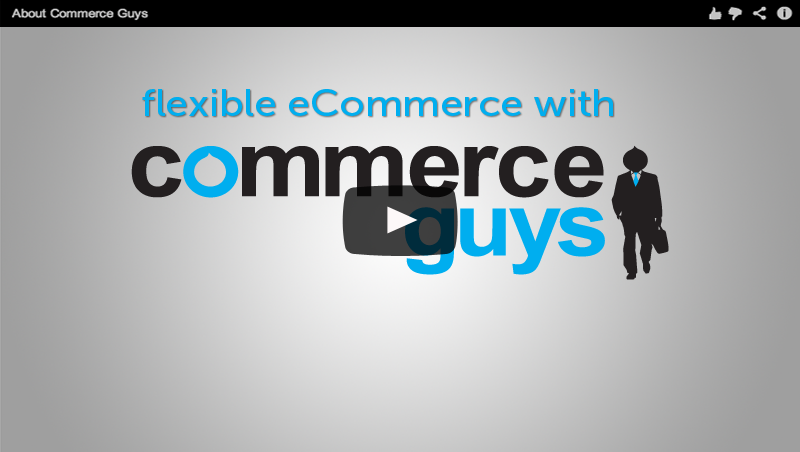 Get Commerce - The Power of "1"